Orleans is such an interesting book. I think it might be one of the more interesting books I’ve read so far this year. Hurricanes have battered the Gulf Coast, which has lead to those states being cut off from the rest of the U.S., because of a horrible, horrible disease. Of course, Orleans is pretty resilient, and is bouncing back. One thing I liked was the list of hurricanes over the years, and also the order that the states along the Gulf Coast were quarantined. It’s a hard world to live in, and you definitely get a really good glimpse of the struggles people have in surviving in this world. The world-building is so interesting! It is a world that I can picture so well, and New Orleans is such a different place that it’s now called Orleans, and a shadow of the city it once was. And the fact that people live according to blood type, which is fascinating because Delta Fever affects each blood type differently, from what I could figure out. The book doesn’t go into a lot of detail about it, and I want to know more about it, because that is definitely different. Daniel’s part of the story really balances out Fen’s story, because you learn what’s happening in the rest of the country. Which leads me to the fact that this book is a stand-alone, with no apparent sequel in sight. The book ends, and you are left wondering if that was all. It’s very open and ambiguous, and you’re left wondering how things work out, since Orleans is a stand-alone. I didn’t mind it, because it works really well as a stand-alone, and it wraps up the story really well. And even though I have some questions, especially with what happened to the characters, I didn’t mind that it’s a stand-alone (even though I would love some sort of sequel, hopefully without a tacked on sort of feeling). 3 stars. 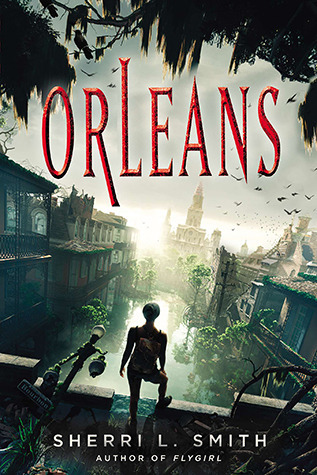 I liked it, and the world is different and there’s so much more to the world than what we get Orleans, but I wish that we had a sequel, to tie up some of the things that weren’t resolved in this book.